By Easter 2001 BUSCA, the 64 Megapixel Bonn University Simultaneous Camera, will undergo the official commissioning procedure at Calar Alto. From then on it will be available for the community. In April 2000 the camera had its first Calar Alto test run. A second run followed in September 2000. The number of CCD-pixels and the target telescope imply a certain similarity with the WFI (at the 2.2m MPIA/ESO telescope) but BUSCA is based on a completely different concept. The instrument is designed for simultaneous four color photometry in a 12arcmin FOV. The light is split into four wavelength bands from UV to visual IR using dichroic filters. In the four corresponding focal planes the same area of the sky is imaged onto 4Kx4K 15micron pixel CCD sensors. Additional filters are provided to define standard wavelength bands. Currently the Strömgren filter set is available. This article gives an overview of the main instrument features and presents some first results of our observing campaigns. A more detailed description of BUSCA is given by Reif et al. (1999, have a look at the on-line version ) and Reif et al. (2000) . 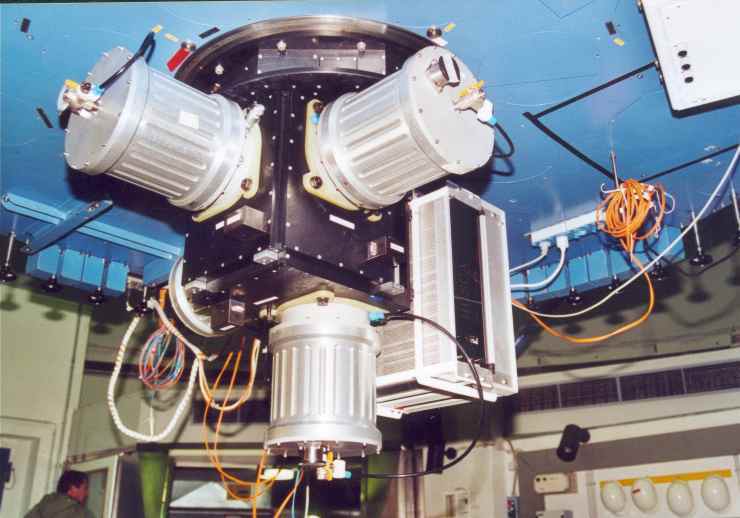 The photograph below shows BUSCA with its four CCD systems mounted at the mirror cell of the 2.2m. The flat hexagonal section immediately below the telescope flange houses the TV-guider system. Inside the cube are the shutter the dichroic beamsplitter (K. Bagschik, 2001 [KB]) and filter wheels (4 wheels, one in front of each CCD dewar). Each filter wheel has four filter positions. Two electronic boxes - the CCD controller and the instrument control unit (Universal Control) - are attached. 1 CCD485 backside thinned (in the uv channel). This device was not yet available in 2000. 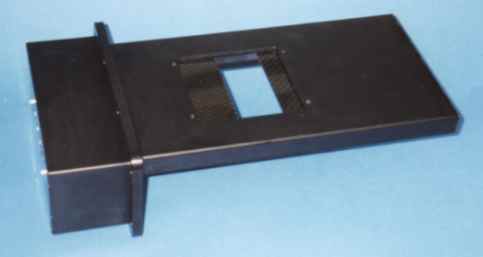 BUSCA has its own TV-guider which was constructed as part of the instrument. All electronic components were provided by the MPIA and are compatible with those of the original unit. The observer uses the standard TV-guider user interface. The BUSCA TV-guider unit had to be much flatter than the original one. As a consequence of the compact design, the guider field is fixed and can not be moved with respect to the observed field. But with a guider FOV of about 6arcmin x 4arcmin one can always find guide stars. The large guider field of view is achieved by converting the aperture ratio to f/4 by means of an additional achromatic lens. The position far outside the optical axis results in a significant astigmatism. This is compensated to a large degree by decentering the lens and by introducing two inclined plane-parallel plates into the TV-guider beam [KB]. The BUSCA wavebands have been defined [KB] with the two most widely used non-overlapping filter systems in mind - Strömgren (mainly used for stellar work) and Thuan-Gunn (for extragalactic work) - and a separate visual NIR band. A complete Strömgren u,v,b,y set is available. Two Strömgren Hbeta filters have been orderd and will become available soon. For the visual NIR band a Bessell I filter was procured. All color channels have one white glas (WG280) filter which allows to use the full bandwidth. The optical path lengths through simultaneously used filters have to be identical. The CCD's can not be focussed individually. Effective tansmission of the available Strömgren and broad band filters (CCD QE not included). Basic principle: Two carbon fiber blades moving on linear ball bearings. Drive: 2x stepper motor + encoder + tooth belt. Operation in either direction. Shortest exposure time: Few milliseconds. The shutter is a removable drawer-like unit. The flat part is inside the instrument housing (the cube) and the left hand side box (with motors/encoders) outside. 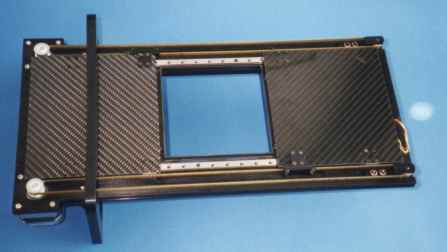 Shutter interiors: Visible are the two carbon fiber blades, the linear ball bearing rails and the toothed belts. In order to test the exposure unifomity flat fields were taken with short (0.1sec) and long (10sec) exposure times. The comparison shows that the remaining non-uniformities are much less than 1% across the full 4K CCD along the direction of the shutter movement. This is consistent with independent timing measurements: We find that the scatter in exposure time across the shutter aperture is less than 1msec peak to peak. The dichroic plane parallel plates of the beam splitter intersect the f/8 beam of the telescope. This produces an unacceptable large astigmatism. With a simple "trick" this effect can be almost completely compensated [KB]: With a second inclined plate of the proper orientation the additional (orthogonal) astigmatism sums up with the primary one to a defocus which is easily compensated. Although this has been tested and confirmed on the optical bench (J. Schmoll, 1997): the real proof had to be furnished at the telescope. Luckily we had several hours with extraordinary good - sub-arcsecond - seeing during both campaigns (in 2000). The PSF found in those BUSCA frames demonstrates the good imaging performance (see the Jupiter image below compared with a space based image). BUSCA at the 2.2m vs. CASSINI: The BUSCA image of Jupiter (left) was taken Sept. 10, 2000 in the BUSCA-uv band (lambda < 430nm). The exposure ran while thin clouds covered unexpectedly the Calar Alto sky. Minutes before, a clear sky seeing of 0.8arcsec was measured. The CASSINI image is from Oct. 8, 2000 (blue filter, centered at 445nm). Thanks to a chance coincidence both exposures show the same rotational phase which allows a detailed comparison. Many features and structures shown in the CASSINI picture can easily be recognised in the BUSCA image. To take advantage of those perfect seeing conditions the CCD's have to be read out unbinned with full resolution (0.176arcsec per pixel). 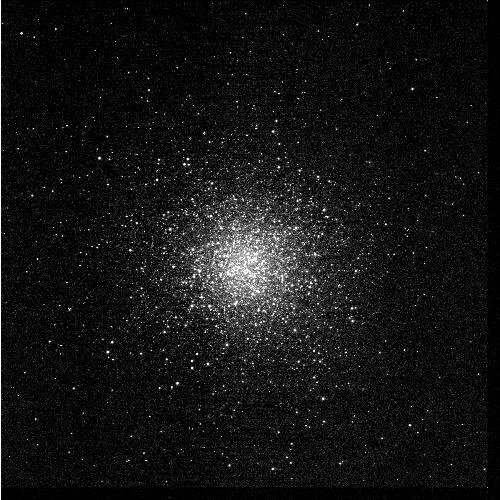 The image of the globular cluster M13 is another example. Stellar images in the four corners show consistently PSF's with a FWHM of 0.81arcsec. M13 observed through the y-filter (exposure time: 5min). Radial PSF profile of stellar images in the four outer corners of the M13 frame. One pixel corresponds to 0.176arcsec. The FWHM's are 0.81arcsec (4.6 pixel). The radial PSF diagrams above show some residual scatter which is due a weak PSF ellipticity (0.08). This ellipticity was found all over the image and is mainly east-west oriented. After some investigation it was realized that it is most probably caused by a small east-west oscillation of the telescope structure. This is a known effect with a pretty small amplitude of about 0.5arcsec which becomes detectable only in really good seeing conditions. The instrument control is completely integrated into the Calar Alto environment. For instrument communication and data acquisition the available hardware (interfaces and cables) is used. The software for CCD camera and instrument control was developed in Bonn and runs now on the "ultra3", the instrument computer of the 2.2m. The observer has access through a graphic user interface (tcl/tk based). One single window contains the basic elements for the control of the CCD camera system and the filter wheels. One of the control features of the software is the "real time display": While data are arriving during data acquisition they are displayed in four thumbnail windows. For each of the four CCDs individual FITS files are stored on disk. The observers environment: On the lower left hand monitor the Busca GUI with its characteristic 4 thumbnail windows for real time data display (active during data acquisition). 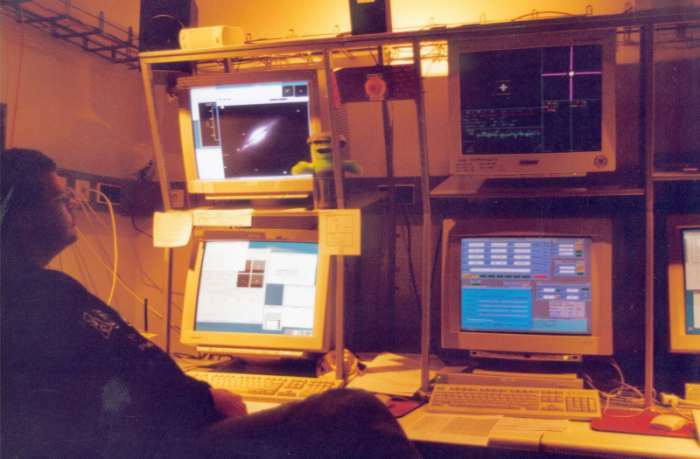 The observing program during the second run in September 2000 included a sample of galatic globular clusters. They were observed through the v,b,y filters. Here we present preliminary b,y-results for the globular cluster M71. Two 15min frames were taken. A standard reduction (bias subtraction, flat fielding) was performed followed by the DAOPHOT PSF photometry for the coadded frames. The calibration is based on Strömgren standard star data of Perry et al. (1987) (see diagrams below). Magnitude and color calibration relations. Residuals with respect to a slope of 1.0 show a scatter of 0.010mag for y and 0.012mag for b-y. Based on this calibration we derive the CMD shown below. To reduce the influence of the field stars around M71 only stars within a distance of 2.5arcmin around the cluster center were included. CMD of the low latitude globular cluster M71 (l = 56 deg, b = -5 deg, E(B-V) = 0.7, varying over the cluster). Exposure time was 30 minutes. The horizontal branch as well as the turn over point are well defined. The diagram is not yet corrected for the influence of field stars. From this diagram a limiting y-magnitude of about 20 mag can be derived (exposure time: 30min, photometric error: 0.05mag). The CMD shows a well defined red horizontal branch and turn off point. Some of the scatter in the diagram may be due to differential reddening, although this has to be investigated in detail. The red giant branch is not well populated as already mentioned by Geffert et al. (2000). Including the "v" frames in our analysis we will investigate metallicities of red giants. Based on the m1 vs. b-y diagram metallicities will be derived using the relation discussed by Hilker (2000). Similar studies of M22 and M55 by Richter et al. (1999) show a large scatter in metallicity which can not be attributed to photometric errors only. CN variations are currently discussed as a possible explanation. BUSCA has been developed with an efficient, reliable and easy to use instrument in mind. Independent observers will tell us if this goal was achieved (we are pretty confident). After commissioning BUSCA will enter the pool of available instruments at Calar Alto. As the Strömgren filter set is currently the only complete set, it is to be expected that BUSCA will mainly be used for stellar work. This may change in future, as new filters become available. The use of existing filters from the observatory (if to be used simultaneously!) is limited to those with identical optical path lengths. It should also be kept in mind, that the 4K x 4K CCDs need large filters (diam. : 109mm) to avoid vignetting. But if a reduced field of view is acceptable, smaller filters could be inserted (adapter needed). A typical 2 inch filter reduces the FOV to about 6 arcmin. The limiting magnitude in the blue, red and NIR channels can be improved by about 1 mag by replacing the thick frontside CCD's by backside thinned detectors. It should also be mentioned that the thick CCD's have a lower than standard CTE (charge transfer efficiency). This would also be improved by new detectors. Observing time can be used more efficiently if the 4-channel CCD-controller were replaced by a faster multichannel system. This is particularly true if under good seeing conditions the corresponding imaging quality can only be achieved with an unbinned full resolution CCD read out (which takes more than 6 minutes!). When the BUSCA system was designed the 4-channel MPIA controller was the only choice. With BUSCA this controller is used at its limits. The BUSCA project was realized with financial support by the Bundesminister für Bildung, Wissenschaft, Forschung und Technologie through grant 05 3BN114 (4). We kindly acknowledge support and advice by B. Grimm of the Max-Planck-Institute for Astronomy in Heidelberg. We would like to thank the Calar Alto staff for their help in getting the new instrument at the telescope and integrating it in the Calar Alto environment. Schmoll J. 1997, Diploma Thesis, University of Bonn; Ein optischer Testaufbau für die Bonner Vierfarb-Simultankamera.